I’m exhausted! I feel like I’m back in school… also feeling a bit inadequate, but also really fired up about enhancing my own training skills as soon as I get back home. Cecilie said during her lecture today “You could shape that way forever and be perfectly fine, but doing it this way will make your training more efficient.” Who doesn’t want to be more efficient? So here’s a summary of what I did and what I learned. I’m not an agility trainer and I don’t know the first thing about agility. This is exactly why I took their track. The most important concept they shared today is the concept that shaping is not just Behavior, Click, Reward, repeat. There is a TON of behavior that occurs between the taking of the reward and the next cue. What happens here MATTERS. 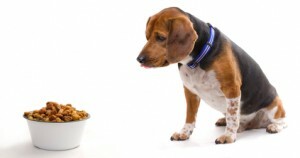 If you don’t pay attention to what occurs after the dog eats their treat and the next behavior, you end up building a lot of “garbage behaviors” in your training. A perfect example I have from my own training is with Petey. He often throws in extra behaviors between reps – a common one I see is he spins clockwise between behaviors. 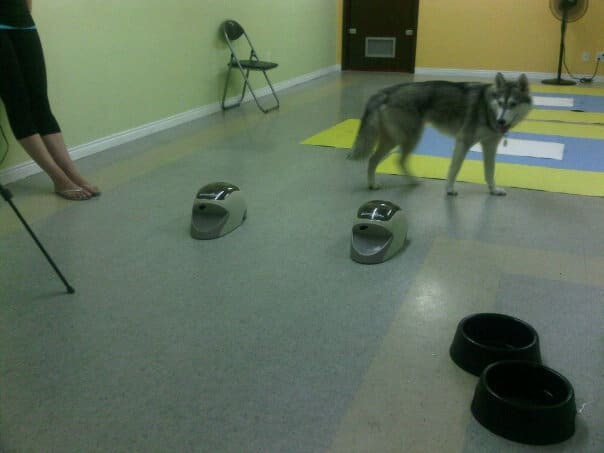 Another common example I see with many dogs is during a Watch Me exercise – after the dog eats their treat, they often start scanning the room and looking at other dogs. In both cases, the eating of the treat has become a cue to do an extra behavior. If we are trying to build focus in the Watch Me, and you continue to allow your dog to eat, then scan, then cue Watch me, then click, eat, and scan, you are actually reinforcing scanning/looking away. Good training eliminates the garbage that happens between repetitions. You can manipulate the environment to prevent those extra behaviors, change criteria/increase rate of reinforcement, or work on reinforcement delivery (position) to prevent garbage behaviors from occuring. Garbage behaviors are also contextual. In obedience, a great behavior to get after eating a treat is for the dog to look back at the handler, since we are trying to build extreme focus on the handler. But in agility, we are trying to have the dog continue along the intended path of the course (criteria would be nose ahead towards line). This was my first Learning Lab for ClickerExpo. Since I am without a dog, I attended as an observer. 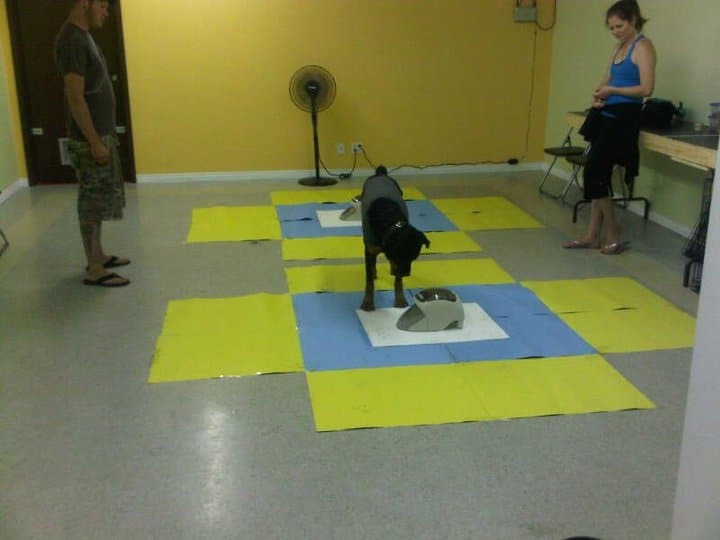 The primary exercises for the dogs in this lab was to implement the “Aim for It” procedure – which in a nutshell, is nose ahead towards intended path. These exercises were fantastic, however, what really blew my mind was the exercises that preceeded Aim for It. Eva and Emelie actually spent a good thirty minutes simply working on the protocols that lead UP to beginning training. This is what happens before you start training with your dog. It is clear that what happens in between training sessions is key to making each training session impactful, an also getting maximum intensity and the right attitude out of the dog. 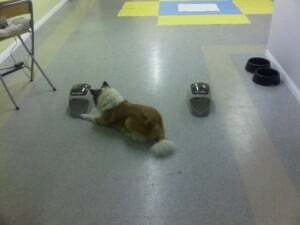 Training starts with a dog at their “Station”. The station can be a mat or a crate. When a dog is at their station, the dog is off-duty and the handler is free to think, plan, and prepare. Once the trainer is ready, the dog is moved from their station to their work area through a “Transport”. Transport, as they define it, is not just walking the dog casually on leash (or off) to their working area. When transporting a dog, they assert that the handler must be fully engaged and contacting their dog at all times. That can mean dog is being lured/lead with food from your hand (and making full contact/munching away), lead with a collar grab, or lead via a tug toy. As soon as the trainer disengages with your dog (food hand is taken away, hand goes off collar, or toy is taken away), training starts, and you c/t the first behavior that meets criteria (for Aim for It, it’s nose ahead). Once the trainer is done the session, he immediately go back to transporting (by using your last food reward as a lure back to the station, or tugging back, or collar grabbing and leading back). This protocol takes “pay attention to your dog” to a whole new level for me and I feel quite guilty for leaving my dogs “dangling” after the end of a training session now. Last lab of the day – I was an observer in Emma Parsons’ Click to Calm Unleashed lab. 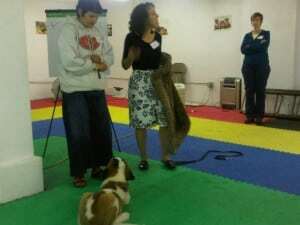 She ran the lab walking through the different exercises she teaches in her Click to Calm class for reactive dogs. What’s amazing about them is they don’t actually require a ton of space, and one thing that was really surprising is how hard she pushes her students… making trainers with their space sensitive dogs work in extremely close proximity by being strategic and careful about entrances, exits, and maintaining high rate of reinforcements (or sometimes just shoveling food into the dog’s mouth). With more research and planning hopefully I can incorporate some of these exercises for classes at When Hounds Fly. The evening ended off with dinner with a lecture by Patricia McConnell – I’ll write more about that tomorrow. Just on break between my last session and dinner so I thought I’d blog a bit about Day 1 lectures and workshops! Ramirez asserts that training Incompatible Behaviors (Watch-Me) is an excellent tool to prevent the rehearsal of aggression and to keep animals safe. However, he clearly states that these approaches do not solve the aggression problem by itself. This is something I figured out by accident, which is why I incorporate Behavior Adjustment Training now in the treatment of dog reactivity. Ramirez showed a video of Kellie Snider in a CAT exercise with a Doberman that is aggressive to strangers that visit their home and has a bite history. The video showed clips of a 38 minute protocol where initially, the dog would bark and lunge at the sight of Kellie (over threshold), but only at the precise moment the Doberman relaxed would she leave. If the dog barked as she was leaving, she would return. After 50 repetitions (roughly), she was able to greet the dog and feed the dog treats, and shortly thereafter she was able to pet the dog on the head. The video itself was quite amazing in that a) she is incredibly brave – the dog was unmuzzled, has a bite history, and was only restrained on leash and being held by a pre-teen boy and b) this dog had never allowed a stranger to come into their home in many years. Ramirez did not discuss BAT (Behavior Adjustment Training) as he is not familiar enough with it at this time. A bit disappointing, since it is my favorite protocol for reactivity now. Session 2: Michele Pouliot – Anticipation is Making Me Great! Michele is a world champion canine freestyle competitor – which is exactly why I took this track (I know very little about Canine Freestyle). 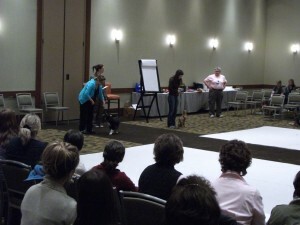 The topic of this presentation was how to use a dog’s anticipation to your advantage as a training tool. Use a “wait” cue and reinforce it either with a primary reinforcer (c/t) or cueing the actual behavior. Cecilie is world class competitive obedience trainer from Norway. This is another area I really don’t know much about, so I was thrilled to have a chance to hear her present in person (tomorrow I am attending a hands on workshop with her on the same topic). A key concept in their training method is to teach a set of 18 “basic skills” that have no cues, then assemble them finished behaviors fluent with very high criteria, then backchain them into performance behaviors, and then assemble routines through backchaining. The analogy she used is “Letters to Words to Sentences”. No cues are given to basic behaviors – so each session is compartmentalized to focus on one of the 18 basic behaviors. How does the dog know which behavior is being worked on? The dog offers all 18 and you just c/t the one you are working on in a session. Time for dinner! Stay tuned for Day Two tomorrow. Comment below if you have questions! 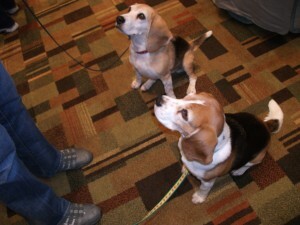 Lastly… BEAGLES AT CLICKER EXPO! On February 20th, When Hounds Fly hosted a party for a litter of 7 week old Icelandic Sheepdogs from Sulhundur Icelandic Sheepdogs. Besides being a ton of fun for all the guests, this was an incredibly efficient way to have these young pups meet over a dozen people and experience a ton of new things! Guests included the future families of the puppies, owners of pups from past litters, and a few friends and colleagues of ours. Remember, puppy socialization is the single most important thing you can do, and you don’t have much time to do it. Socialize and train early! (And check out the videos and photos below). 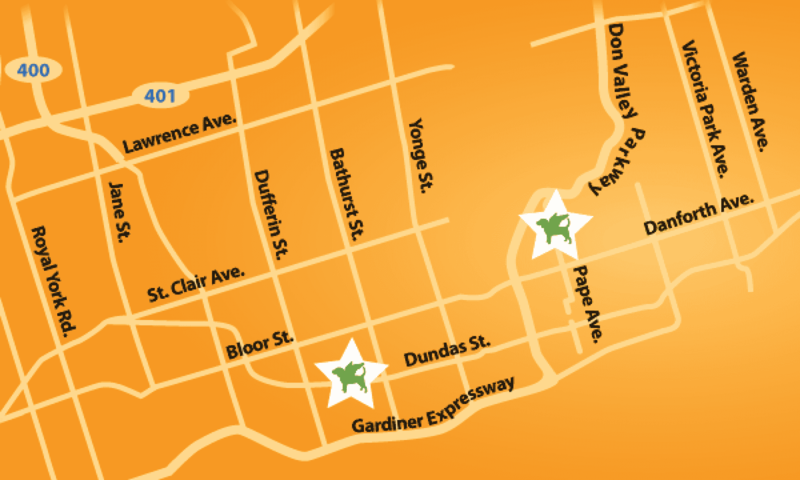 There is a little daschund in our neighbourhood that I see periodically on our walks. The little daschund must weigh all of 8 pounds soaking wet. Her owners seem to really care about her because she gets walked regularly, even in this cold weather. I also believe this little daschund was probably a rescue, because it’s been the same size since I first saw her. Unfortunately I have never talked to their owners because this little daschund is leash reactive (she barks, lunges, and acts aggressively when dogs get close by). A pinch collar is a tool of punishment. If the dog pulls, the metal ends jab into the dog’s neck causing pain, which causes pulling to stop. 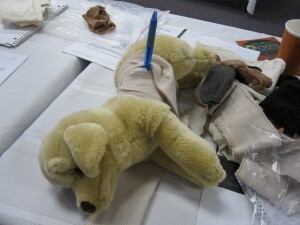 If a leash correction (leash tug) is applied firmly, the metal ends jab into the dog’s neck also causing pain. Most dogs will walk gingerly and carefully when you put a pinch collar on them to avoid pain, so they are often used by dog owners who are too impatient to teach loose leash walking. The owners of the daschund, while on walks, would apply a leash correction every time the dog barked, lunged, or reacted to nearby dogs. Very quickly (within a couple of short weeks), the daschund’s outbursts stopped. She could walk right by me while I was walking Petey and it was as if the little daschund didn’t even see him. On the surface, I’m sure the owners of the daschund were delighted with the results. Fast forward now to January. Petey and I were out for our afternoon walk and we see the little daschund again. I actually didn’t recognize her at first since she was all bootied and coated up. As Petey and I walk by, she started barking, lunging, and pulling towards us. Because the threat of punishment is now a long gone memory, her old behaviors have returned. The moral of the story is – the heart rules the head. Fearful, aggressive, and reactive behaviors are rarely driven by conscious decisions – they are driven by emotions. When behaviors are driven by emotion, the only way to change the behavior is to change what’s in the dog’s heart. The pinch collar never helped the little daschund learn to be confident – in fact, she looked quite depressed while she wore it. It never helped her learn to feel comfortable around dogs – in fact, the sign of a dog coming meant the risk of leash correction was imminent. All the dog learned to do was stay still and bottle her feelings up. I can understand the allure of a “quick fix”. I wish I could help my clients with reactive dogs walk by other dogs in close quarters and be cool with it in a matter of a couple of minutes. 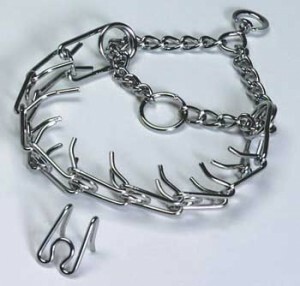 I can’t – but a punishment trainer can throw on a pinch collar and create an illusion of a “fix”. But it’s just temporary suppression – not long lasting change. My clients, however, day by day, week by week, are slowly changing what’s in their dog’s hearts. And once you have changed what is in a dog’s heart, their head will follow. The second big thing I (re)learned from Kathy Sdao’s seminar is the importance of the sequencing and contingency required for effective conditioning (or counter conditioning). In plain English – if you’re trying to get a dog to love something, or get a dog over their fear of something, you can’t screw this up! In Diagram 3, the bell proceeds the food. 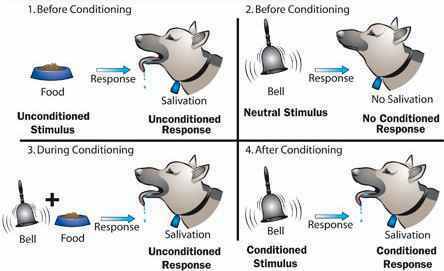 That’s how conditioning works – the stimuli is followed by the food, so that in Diagram 4, the bell causes salivation. If the food were to be delivered before the bell, no conditioning would occur. Sounds simple right? The emotional qualities and feelings the dog gets with food bleeds backwards into the bell. Here’s where this simple sequence gets mangled in practical dog training and behavior modification. What if you were trying to get your dog used to being left home alone as part of separation anxiety work, so you begin by getting out a very special food dispensing toy, take it to the kitchen counter, and take a block of cheese and begin dicing it up and prepping the toy. The dog sees you do this and gets excited. Then, you give the dog the food toy and then proceed to put your shoes on and go out the door. By going in this order, the food dispensing toy, block of cheese, dicing and prep at the kitchen counter will very quickly become a predictor of something really scary happening – you leaving home. With enough repetitions, your dog might start exhibiting signs of fear and anxiety at the mere sight of the food dispensing toy! That’s because the sequence is all wrong – food, then departure. One of the participants at the seminar remarked that her dog started hiding in fear whenever she brought out a can of dog food and began opening it – because that always meant she was leaving. For this dog, instead of conditioning good feelings around a departure, bad feelings became conditioned around cans of food! Are you crazy? If I eat that, you'll leave!!! A better way to handle this would be to put your coat and shoes on, get your wallet, keys, and cell phone, and then prepare the food. Let’s say you are working with a reactive dog and off in the distance, you see a dog approaching but your dog hasn’t spotted it yet. If you cue a behavior (like “Watch me”) and the dog performs it, and gets their click then treat, you may think you have dodged an outburst. But if the dog performs that behavior and then immediately after that, sees the dog, you can easily poison “Watch me” to mean that a dog is coming! Very quickly, you’ll see a dog start panicking and scanning when you cue “Watch me” because you got the sequence wrong. The only way to handle this is to ensure that the dog sees the trigger first BEFORE you cue “Watch me”. Otherwise, if dogs follow “Watch me”, the fear and anxiety of dogs will bleed backwards into “Watch me” and ruin your cue. On September 18th and 19th I made the six hour drive back to Endicott, NY, to attend a weekend long seminar hosted by Clicking with Canines (the school where I completed the Karen Pryor Academy). This was my first time hearing Kathy Sdao speak in person and with over sixteen hours of lecture, I left with so many new ideas that I’ll have months of blogging content in the hopper to draw from now. 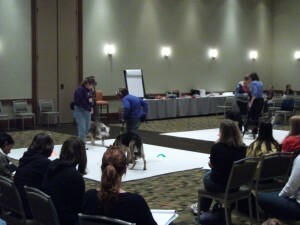 One of the biggest topics of the seminar was the concept of conditioning new reinforcers. Big revelation right there for me. We spend a lot of time conditioning new emotions towards stimuli (i.e. 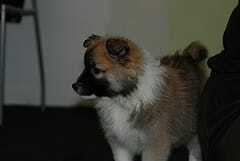 getting a dog over fear) and training new behaviors. But, how often do we go out of our way to create new things that we can use to reward our dogs? Over the weekend we saw many clips of Kathy from her University of Hawaii days working with dolphins. One reinforcer they conditioned was a hand clap. In one clip, a dolphin performed a behavior on cue and the handler didn’t feed it a fish, but instead, did a big open air hand clap. The dolphin saw the handclap and became absolutely giddy with joy! How awesome is that? How did you condition a leash, a click, or coming to school to produce such strong emotions? Simple – every time you showed your dog any of those 3 things, something wonderful happened immediately after. The leash is always followed with a walk. The click is always followed by a treat. Going through our entrance is always followed by a ton of food-based training. My personal training goal is to now condition my dogs to have additional reinforcers. I’m trying to train Petey to become tug toy crazy. All I’m going to do now is prepare his dinner (in a bowl) and hide it somewhere like a bookshelf or counter. Then, I’m going to bring out the tug toy and tug with Petey for 15 seconds and then quickly bring down the food bowl and surprise Petey with dinner. Just by doing that, I’m going to attempt to transfer the emotional value of dinner to the tug toy. Similarly, for both Duke and Petey, I’m going to try to condition a “thumbs up” as a conditioned reinforcer. All I’m going to do is when I click for a behavior I like, I’m going to give a thumbs up first and then feed my dogs. The emotional value of the food reward should bleed backwards into the thumbs up, and what I’ll be looking for is tailwags and a smile when I give my dogs a thumbs up. So, my challenge to you is – you’ve trained a lot of useful and cute behaviors in your dog. What new conditioned reinforcer will you start creating? 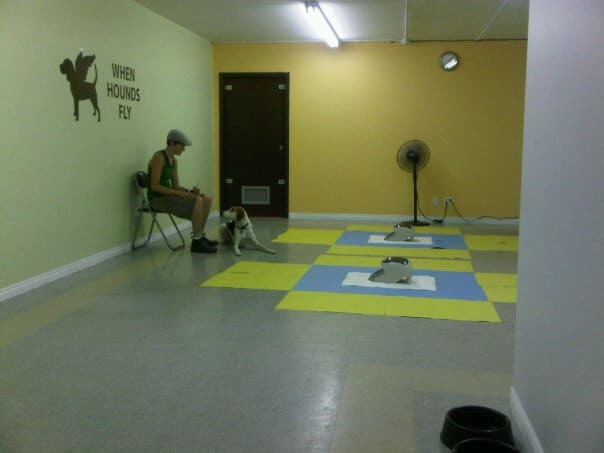 Over the weekends of August 21 and 22; and August 28 and 29, canine volunteers and their humans came to visit When Hounds Fly after classes ended to participate in the first set of canine cognition research experiments, conducted by Krista Macpherson from the University of Western Ontario. Two Manners Minder remote training devices were setup to dispense food on different intervals – one was set to dispense every 15 seconds, and the other was set to dispense every 60 seconds. After multiple repetitions, were dogs able to figure out how frequently each one paid off, and proactively move towards the machine that was ready to pay off next? 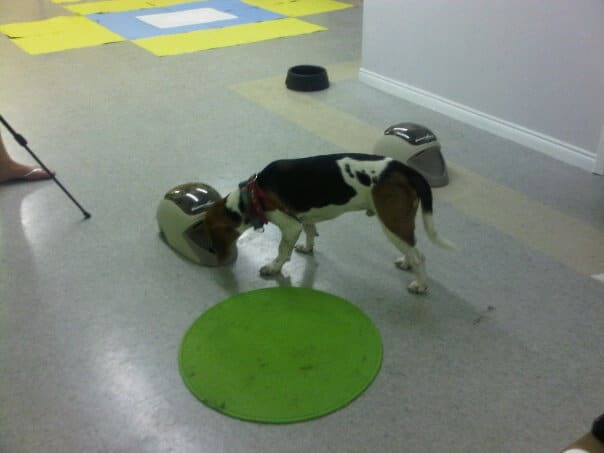 At first, the dogs were introduced to the Manners Minder machines. The machines are set to produce an audible tone prior to dispensing (the tone is normally used as an event marker, i.e. clicker, for training). Relatively quickly, each dog learned that the tone meant that the machine was going to pay. Next, the machines were moved over and placed on mats created by taping different colored bristol boards together. The bristol boards serve as a visual indicator for analyzing the position of the dog relative to either Manners Minder during the task. The owner and the dog start at a chair placed in between the two machines. The owner is wearing sunglasses, as dogs often can pick up on where humans are looking at for cues and information (i.e. the owner might start staring at the next machine to pay, and the dog will very quickly learn to go to the machine the owner is looking at). What I found particularly interesting was something that Krista said about the differences between dogs and other animals. When doing these sorts of tests on rats or pigeons, the variance in behavior is relatively small. What was particularly interesting to see is the wide range of behaviors and strategies that each dog used. Some dogs were very thoughtful and deliberate in when they chose to move back and forth between machines. Others used brute force and just simply went back and forth between machines almost non-stop. Many dogs (especially ones trained using shaping) initially believed that behaviors they performed could influence whether a machine would pay out (common behaviors included intense staring, pawing, mouthing, nose-targeting different parts of the machine – my Beagle, Petey, offered a play bow to the 60 second machine; Arlo, Emily’s hound, offered a favorite trick – the armpit sniff – to the machine; Farley, Jenn’s Beagle, howled at the machine as if to say “Feed me now!!!”). A handful of dogs appeared to really be “thinking about it” and there were times where it seemed like they went over to the 60 second machine to get their payout right on time. My Beagle, Petey, just decided to pick up one machine and drag it closer to the other so he didn’t have to travel as far! Some of the dogs are highly trained (agility dogs, advanced obedience, or just a really well trained family dog) and others were pretty raw (brand new rescue, zero training) – since the activity has nothing to do with performing behavior, it seemed to me that trained dogs did not necessarily figure things out faster or better. Here’s a few more photos I took of some of the dogs that volunteered in August. If your dog tells you they’d like to participate, just email me at andre@whenhoundsfly.com and I will include you in future calls for volunteers. Krista is going to be running another set of experiments on the weekend of the 18th and 19th. Farley the Beagle's first taste of Roll Over! As many of you may know, my rescue Beagle, Duke, is dog reactive. Initially, he was fearful and aggressive towards dogs in all settings (off leash, on leash, at the dog park, anywhere!) and before we began working with him, the mere smell of a dog (a dog’s scent lingering in the hallway of our condo even thirty minutes earlier) would trigger a howling fit. At the time, the commonly prescribed approach to address dog reactivity was to train alternate behaviors (Watch Me, ignore the dog) and also desensitize and classically counter-condition new feelings towards dogs. Books like Feisty Fido by Patricia McConnell and Karen London, Fight! by Jean Donaldson, and Click to Calm by Emma Parsons covered these protocols in great detail and are very well-read in my library. Next, Control Unleashed by Leslie McDevitt introduced another tool – rewarding the dog for looking at the scary/hated dog and putting that on cue with “Look at That!”. Along the way, we got Duke’s reactivity down to a point where walks became sane again and Duke was able to return to attending group obedience classes. But, after nearly four years of working with him, his reactivity is reduced, but not cured, and he is what I’d call “manageable”, but still requires a lot of management. Many dogs (including ones I’ve been hired to help with) DO become “cured” from this work but Duke isn’t there yet. 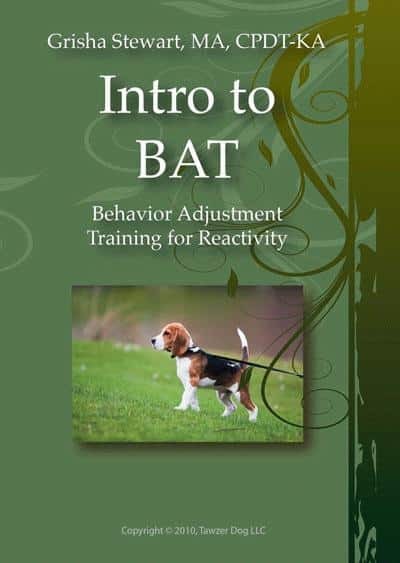 Recently, I ordered and viewed Grisha’s first DVD on the subject – Behavior Adjustment Training (BAT) for Fear and Aggression from Dogwise.com. This DVD is a live recording of a lecture she did on BAT in Novato, California, in January 2010. It is NOT intended for average dog owners (its way too dog-geeky) but is a perfect watch for professional dog trainers and behaviorists that have a solid understanding of operant conditioning and classical conditioning. In a nutshell, Grisha explains that reactive dogs have learned that lunging and barking sends scary things away. Either the handler, due to embarrassment and wishing to stop the dog from rehearsing unwanted behaviors, backs away and creates distance when their dog reacts – or the scary thing (the other dog owner, for example), leaves because they are afraid of the lunging dog. Consequence = Scary Dog goes away. There are three stages of BAT, which I won’t go into detail with here – but in its third, purest stage, no food or toys are used. The simple functional reward of being allowed to leave by offering an appropriate calming signal is the sole reward. When I first heard about BAT, I found the concept interesting, but I am delighted to say that with some preliminary exercises I did with Duke, the results have been quite positive. Today, by coincidence, just before completing this blog entry, I had a chance to work with a reactive dog client with some ad-hoc BAT exercises at the nearby dog park. Both of us were extremely pleased with the progress we were able to make in decreasing distance and keeping the dog calm and under threshold. The relaxed body posture and demeanor of the reactive dog was significantly different than when we previously were using traditional food-based classical counter-conditioning techniques. The dog’s owner commented on our swift progress and how much her dog seemed to “enjoy the game” of BAT. I look forward to working more with BAT and sharing this new technique with the reactive dog owners in our community. For average dog owners wishing to learn more, Grisha has put out a second DVD called Organic Socialization that appears to be better filmed and presented in a way that average dog owners can absorb and comprehend the information. That being said, for this or any other aggression issue, consult a positive reinforcement trainer or behaviorist that has a solid understanding of operant conditioning and classical counter-conditioning when you get started. I cancelled classes at When Hounds Fly weeks ago so that today, I could complete a course on Pet First Aid, issued by Walks ‘n Wags Pet Care and taught by Renee DeVilliers of All About Dogs. 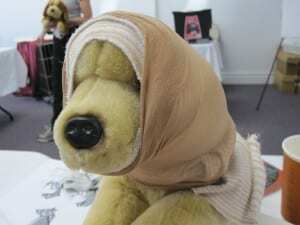 The course covered topics ranging from preventative strategies, emergency restraint and transport, bandaging skills, bleeding, airway obstruction, mouth-to-snout, CPR, ingesting toxins, overheating, and a lot more. It was a long day! My ear's been torn off! Ouch! How did I impale myself with this blue pen? Here, Renee is showing us how to dress a wounded tail. Cadence is wearing a pair of granny stockings and is handling it quite well. Mustard is not my color, lady. In the event of a medical emergency where you need to rush your dog to the vet or emergency – call ahead to let them know you are coming and describe the nature of the emergency. Unlike people hospitals, they may or may not be ready for “anything”, so giving them advance warning allows them to be ready to treat your dog. Every minute counts. Hurt dogs can bite (we know this!). Condition your dog to being muzzled so that later in life, if the emergency calls for it, you can safely muzzle your dog and prevent him from biting you or someone else. Shaving down long-haired dogs in the summer to cool them off actually can increase the likelihood of them overheating. Their hair, when brushed out, acts as insulation and allows cool air to travel to and around their skin. 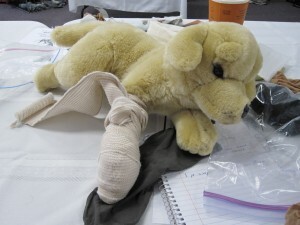 Pet First Aid is not just for dog industry professionals. Sure, there are plenty of dog groomers and dog walkers at the class today, but there were also two couples – one of which was about to get their first puppy. I think every dog owner could benefit from taking a Pet First Aid course. Pet First Aid is taught almost monthly at All About Dogs so contact them about getting on the list for the next session if you’re interested! And if you’d like me to dress your dog’s head like the stuffed animal I did for photos, just for fun, let me know. A couple of weeks ago I received a phone call from Krista Macpherson, a dog cognition researcher from the University of Western Ontario. She found When Hounds Fly and reached out to us because she was looking to partner with a dog trainer with a sound understanding of science-based dog training. I was floored! After meeting with her last week and geeking out over dog cognition and experiments, she shared two published studies she worked on. The first was a radial maze study that was published in Science. The other was published in the Journal of Comparative Psychology and it asked whether Dogs seek help in an emergency (the popular press picked it up and coined it the Lassie Experiment). Owners faked heart attacks and also faked having bookshelves fall ontop of them. Unfortunately, the dogs didn’t go out and seek help like Lassie would. Oh well, that just means we can train “Get help!” as an operant behavior, put it on stimulus control, and have it handy just in case. Lassie! Go get help! Or just sit there. I’m so excited about this project for a bunch of reasons. Firstly, clicker training exists because of the work done by scientists like B.F. Skinner in the 60s. Without science, we would still be stuck following archaic training methods prescribed by old-school compulsion trainers like Koehler or the Monks of New Skete. Secondly, having an affiliation with a researcher from the University of Western Ontario will help undecided dog owners make a good decision to enroll their dog in a humane, positive reinforcement dog training school instead of choosing a yank-and-crank compulsion trainer. Lastly, the geek in me (I trained a goldfish after all) gets fired up at the thought of helping run science experiments involving my students’ and friends’ dogs!